Making these muffins is super quick and just requires a little whisking and mixing once you've got the sweet potato cooked and ready. I roast sweet potatoes pretty much every other day. Japanese/Korean sweet potatoes are my personal favorite but I also adore the regular orange-flesh ones (also the ones my husband and son eat regularly). For this recipe, you want to use the regular orange sweet potatoes, which has the moisture you want for the muffins. So plan ahead...next time you roast sweet potatoes for lunch or dinner, set one aside to give these muffins a try. The muffin batter has mashed sweet potatoes, olive oil, sugar, eggs, whole wheat flour, leaveners, salt, and cinnamon in it. But I have to say my favorite ingredient must be the chocolate chunks! Stirring those into the batter was my favorite part! I reserved some of chocolate bits for the top just to make sure there'd be plenty of chocolate visuals to appreciate. These were fun to try and really easy to make. I love finding new muffin recipes to incorporate into our routine because the fellas really enjoy them in the morning and on weekdays, they are a lifesaver in terms of quick and easy. I seriously do not know what I would do in the event of some kind of world shortage on either sweet potatoes or chocolate. I love these two things and it was fun to discover they go so well together! *For roasted sweet potato: I like to bake whole sweet potatoes, wrapped in aluminum foil, in a 350 degree oven until soft, about an hour. Let cool, then mash with a fork. Preheat oven to 350 degrees. Line a regular 12-cup muffin pan with liners. In a medium bowl, whisk flour, baking powder, baking soda, cinnamon, and salt together. In another bowl, whisk together the oil, sugar, eggs, and mashed sweet potatoes. Add the wet ingredients into the dry, stirring until almost combined. Fold in the chopped chocolate. Divide batter among the 12 muffin cups. Bake until golden on top and muffins spring back slightly when touched, about 20-24 minutes. Let muffins cool for 4-5 minutes in the tin, then remove them to a wire rack to cool completely. I like the combo of chocolate and sweet potato..maybe pumpkin puree would work great too. Yes, for sure...I've made pumpkin chocolate chip bread and it's similar and tasty. Hello Monica! It's true that six muffins is not enough. They look so good that I'm sure there was an argument to see who would eat the others. All jokes aside, I will try this recipe because I love the combination of the sweet potato and olive oil and bitter chocolate. And, I'm fond of quick and easy cake recipes for those days when I'm running out of time. The only thing is that I always have surprises with ounces to grams conversion calculator. Have a great week ! haha - agreed! Six muffins do go quick but on the flip side, a dozen seems like a lot. ; ) We had just polished off a dozen chocolate-choc chip muffins and the weekend was approaching so I didn't need too many in this case. I do love simple bakes. Hope you try these out...or just have fun in the kitchen! I have made similar muffins before with butternut squash and we love them! These look delicious. I can imagine. That sounds great! Thanks, Amy. It's so funny because that's exactly what my husband said...that he liked the "subtle sweetness"! I was tempted to say that but there is sufficient added sugar as well, to be fair. But all said, these muffins taste wholesome in a good way. Can't beat that when we're talking about treats. That is a wonderful recipe indeed! We love sweet potatoes too and of course chocolate but I would have never thought to combine the two. Thanks for testing these out for me - I'll have to give it a try! I don't eat too many but my mother in law does so I'll roast some extra for these muffins. Actually I was thinking to make sweet potato and date muffins.I'll follow your recipe and chocolate as well. They really look moist and soft textured. 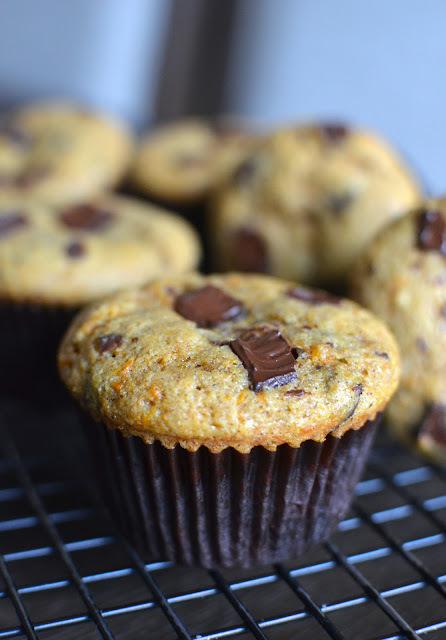 Sweet potato is my favorite and I love that you added themto these yummy muffins! They look delicious and would not last long around here! Please add a Pinterest button to the sharing options. If you put your mouse over any of the pics and hover there, a pinterest button should appear in the upper left corner for pinning. Thank you. What a great way to use sweet potato, I need to try these, they look divine! Such an Interesting recipe, Monica. We love sweet potatoes here too and I do make breads with it often, but I haven't made any muffins with sweet potato and chocolate. I am sure my family would go gaga over these beauties. Loved that you used chocolate chinks here. Can't wait to try them. They were really good...hope you try it out one day! Hi Monica, never thought to add sweet potatoes to baked goods but I bet they add moisture and sweetness. They look delicious. What an unusual combo!! I love the idea! Same here...I saw it and had to try it. Really easy once you have the roasted sweet potatoes on hand. I loveeee baking with sweet potato - these muffins are so right up my alley! And with chocolate chunks ... I wish you could send me one to have after lunch!! Sweet potatoes and chocolate together? Who would have thought?!! Love it. This is such an interesting combination...sweet potato and chocolate...and I am loving the look of it...light and fluffy...I sure need to give this a try. Thanks for sharing the recipe Monica. It totally works and feels healthful, Juliana. ; ) Thank you and hope you have a great weekend. Now that certainly isn't a combination I would have thought about so thank you for the inspiration. Monica your muffins look so moist and delicious. So after you broke the one in half for the photo it was so tempting...you had to have 3? I would certainly have to make a double batch.